Android Nougat 7.1 ROM, Lineage OS 14.1 for Galaxy Trend Plus has now arrived via an UNOFFICIAL build. In addition to this Lineage OS ROM for Trend Plus, we also had the legacy CyanogenMod 14.1 for Galaxy Trend Plus. If you want some more Lineage OS ROMs or wanna taste the OFFICIAL Lineage OS build then stay tuned to the Lineage OS 14.1 ROM collection page. As always, this Galaxy Trend Plus Lineage OS 14.1 is brought to you by developer ishant. THIS IS AN INITIAL BUILD WHICH MAY HAVE MANY MORE BUGS THAN YOU CAN IMAGINE. HAVE A BACKUP BEFORE FLASHING THIS AND TRY AT YOUR OWN RISK. Installing a custom ROM on a Galaxy Trend Plus (kylepro, GT-S7580) may require the bootloader to be unlocked, which may VOID your warranty and may delete all your data. Before proceeding further you may consider backup all data on the phone. You are the only person doing changes to your phone and I cannot be held responsible for the mistakes done by you. 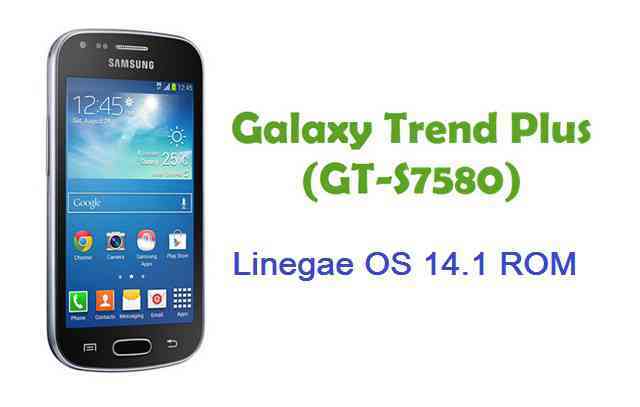 Download and Copy the GApps and Lineage OS 14.1 for Galaxy Trend Plus ROM ZIP to your phone. First flash the Galaxy Trend Plus Lineage OS 14.1 ROM ZIP from device. Then flash the GApps zip from your device memory. Reboot and Enjoy the Nougat 7.1 Lineage OS 14.1 ROM for Galaxy Trend Plus (kylepro, GT-S7580). Copy the latest Lineage OS 14.1 for Galaxy Trend Plus ROM ZIP file to your phone. Stay tuned or Subscribe to the Galaxy Trend Plus (kylepro, GT-S7580) forum For other Android Nougat ROMs, Lineage OS 14.1 ROMs, other ROMs and all other device specific topics. Thanks people! My trend plus works much better now than with original Samsung ROM 4.2.2. There is only one bug: After flashing phone keyboard doesn’t work. Solution: Download keyboard to PC and transfer it to SD card and install it on the phone. On this device you can’t use Skype version 8 or above, ’cause hardware doesn’t support new Skype (it can be installed and can start but sound is like ”screaming”. Solution: Install Skype version 7, so far it works fine! Viber works fine, latest version. Did not test Whatsapp. Video calls on Facebook messengers work fine. Thanks people! My trend plus works much better now than with original Samsung ROM 4.2.2. There is only one bug: After flashing phone keyboard doesn’t work. Solution: Download keyboard to PC and transfer it to SD card and install it on the phone. On this device you can’t use Skype version 8 or above, ’cause hardware doesn’t support new Skype (it can be installed and can start but sound is like ”screaming”. Solution: Install Skype version 7, so far it works fine! Viber works fine, latest version. Did not test Whatsapp. Video calls on Facebook messengers work fine. Enjoy! It will be surely useful for other users.